It was very cold in the Netherlands, traffic was gridlocked just two days before so I was wondering if the road was clear enough to get to Amstelveen. The road was not really slippery and we arrived safely at the P60 right after we bought ice skates for the whole family. When I was walking through the cold to door of the venue I remembered when I went to Epica in Amsterdam and they used a lot of fireworks. I really wanted to warm myself by the flames they had on stage. Epica recently released their new album Design your Universe that again is better than it's predecessor. On that album a big mark was made by the two new guys. 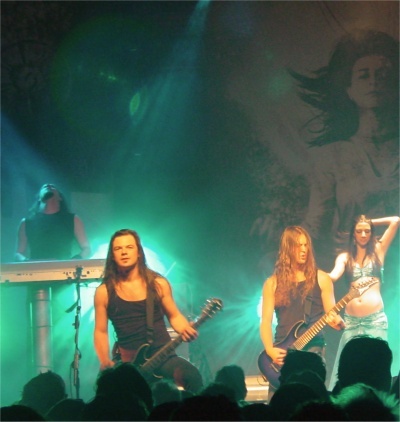 Drummer Ariën Van Weesenbeek is not really new, he already played the drums on The Divine Conspiracy but was at that time not an official member of Epica. 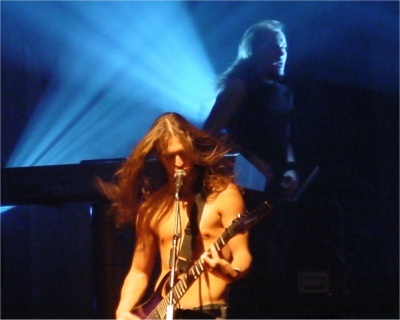 And from his former band God Dethroned he also brought with him Isaac Delahaye as a replacement for Ad Sluijter, so now everyone in Epica has long hair. 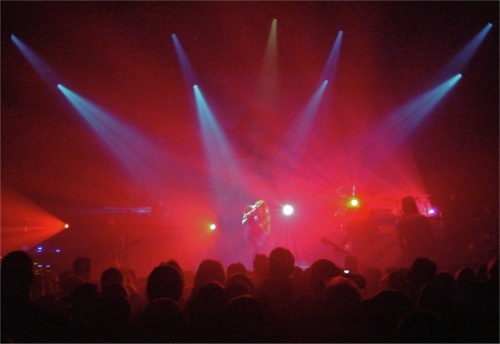 With the two new members coming from a death metal band the sound of Epica has become a bit heavier. Isaac also participates in the grunting, the beautiful voice of Simone Simons is still present as a contrast to the heavy male vocals. My expectations were high (mainly because of the brilliant show in the Melkweg two years ago) and I was hoping to hear a lot of new songs. Especially Kingdom Of Heaven I really wanted to hear and from setlist from other Epica shows I had high hopes. When we entered P60 the support act Trail Of Tears was already playing. A big wall of sound approached us as we climbed up the stairs. We stayed for a few songs but we could not really tell if they were playing different songs or if they got stuck on repeat. The male grunting vocals were not really dynamic just like the guitar riffs. The female vocals were not mixed in very good and hurt my ears, this was better in the second half of their performance. The second part was more interesting but they were still playing at the time when Epica was supposed to start so I really welcomed the phrase "this is our last song"". The rest of the audience were more enthusiastic but Trail Of Tears is not my cup of tea. As expected Epica started with the intro tape and the first song of the new album. Also as expected the sound was very very very good. A treat for my ears in contrast with my eyes, the huge amount of flickering and moving lights was intense. This was probably because they sadly did not use fireworks, I do not know if they stopped doing that or if it is not allowed in the P60. I was hoping to hear a lot of new songs but Sensorium was played very early in the set. Many bands play old songs to get the action started but Unleashed and Martyr Of The free Word from the new album received much more appreciation. Just like the two songs after that, Fools Of Damnation is one of my favourite Epica songs and Star Wars movie score Imperial March could have been made for Epica, and of course they played it a lot heavier than on the album A Classical Conspiracy. 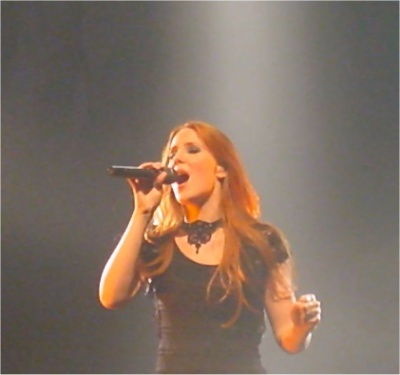 Tides Of Time is a piano ballad with a leading role for Simone Simons and a supporting role for keyboard player Coen Janssen. A nice mellow intermezzo that was followed by two heavy oldies. At this moment I got the frightening idea they were not going to play Kingdom Of Heaven. That and the fact that I really did not want to hear Seif Al Din and Facade Of Reality made me a bit disappointed. The set ended with the title track of the new album, this fantastic song was played perfectly. The encore started with Cry For The Moon, another heavy old song I was hoping they would skip, and ended brilliantly with Consign To Oblivion. I went home with mixed feelings, Epica is still one of the best dutch bands around and if you can make it to one of their shows then I advice you do so. I started this concert with in the back of my mind the brilliant performance at the Melkweg two years ago and they sure did not reach that by far. The choice of songs was not to my liking, I would change the old songs for Kingdom Of Heaven anytime, but that is always a personal thing. No fireworks but irritating flashing lights right in your face. On the other hand the new guys were a very good addition and Epica is heavier than ever, and it is the first time I saw a rock concert with a belly dancer.